This is an area of mudflat and salt-marsh at the confluence of the Rivers Irvine and Garnock. Part of it is a SSSI. 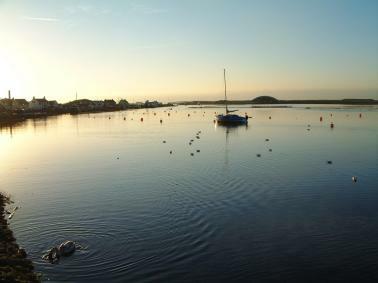 The best place to view is from the car parks along the Harbourside at Irvine, NS 15 83. Irvine rail station is 0.5km away. Walk along the path to the harbour mouth. A second viewpoint is from the old stable block beside the old Irvine racecourse (NS 07 400). Get here by following the road for Bogside Golf Club and where the road doubles back to the clubhouse continue on for 200m to park (beware of the deep potholes and show courtesy to golfers). This area had been marked as the site of a land-raise dump but a public enquiry imposed sufficiently strict constraints to dissuade North Ayrshire Council from proceeding to date. A third viewpoint is at the old ICI bridge at NS 298 99. This is reached by walking round the old racecourse from the second viewpoint. This point provides good views of the upper Garnock and its roosting waders and wildfowl. Do not cross the bridge to the industrial area. Lots of parking spaces; disabled parking bays at Magnum. Flat paved surfaces alongside harbour wall. Pond behind Magnum: several places to park, paved flat surfaces. Racecourse: park on rough ground, good view over racecourse from car. On local cycle route and National Route 7. This forms part of the Irvine Circular Trail. The Flats are good at most times of the year (although summer is quiet). The best time to go is two hours or so before high tide as the waders get pushed up onto the mud in front of the car parks (note that the tide comes in quickly in the estuary and usually covers the saltmarsh by the time of high tide). The mudflats are great for passage waders (e.g. the amazing 69 Curlew Sandpipers in autumn of 1999) as well as Greenshank , Turnstone , Curlew , Golden Plover , Lapwing , Black-tailed Godwit . The Garnock is good for large numbers of Wigeon and Red-breasted Merganser over the winter. The large numbers of waders often attracts a Peregrine or two who can typically be found perched on trees washed down on to the salt marsh. Rarities have included Marsh Harrier , American Wigeon , Avocet , Pomarine Skua and Black-headed Bunting and the UK’s first accepted record of Barrow’s Goldeneye . An escaped Ross’s Goose has also spent some time in the area. A White Stork also flapped over the golf course as a highlight of the 2001 Bird Race. Behind the Magnum leisure centre is the boating pond (NS 08 78). In winter this can be good for ducks including Scaup , Wigeon , Gadwall , Pochard , Tufted Duck as well as Mute Swan , Little Grebe and roosting gulls. From the harbour mouth you can look into Irvine Bay to get terns, Eider , Shag , Manx Shearwater , Gannet and various divers in winter. In recent years this has been a favoured location for a male King Eider . The race course area is superb for Short-eared Owl in the winter (up to 7 birds at a time, often very close). The marsh area is also good for hearing Water Rail . The Garnock upstream of the bridge over to the ICI plant is good for waterfowl (including a recent American Wigeon ) and waders (particlarly Greenshank , Curlew Sandpiper and Black-tailed Godwit during passage). In March 2009, RSPB Scotland acquired a new reserve at Irvine, North Ayrshire with the support of SNH. The 19 ha site forms part of the Bogside Flats SSSI, designated for its saltmarsh and mudflat habitats and is the area between the railway and the River Irvine, behind the old Ayrshire Metals Factory (now housing development). The reserve is mainly grazed floodplain within a flood defence bund although there is also a small area of saltmarsh. The rough grassland is used as a foraging area by Hen Harrier and Short-eared Owl and the site provides a roost site for wintering wildfowl and waders. This reserve is located within the Irvine Bay Urban Regeneration Area. This area has historically come under considerable development pressure, which continues today with ongoing pressure for new housing, industry and tourism development. Management by RSPB Scotland will ensure this area of the SSSI is protected from damaging development. The Harbourside has lots of pubs selling decent beer and food. The Maritime Museum, Magnum Leisure Centre and the recently refurbished Harbour Arts Centre are worth visiting. This entry was posted in Locations - North Ayrshire on 30-Sep-2010 .